The State government’s nod to construct 3,500 affordable homes within Pune Municipal Corporation (PMC) limits by 2019 will not only bridge the demand-supply mismatch in the city but also take the government a step closer to achieve its ‘Housing for All’ mission under Pradhan Mantri Awas Yojana (PMAY) initiative. The Pune Smart City Development Corporation Ltd (PSCDCL) has invited private participation to develop e-connectivity infrastructure in the Aundh-Baner- Balewadi (ABB) area. Once implemented, it will help create an enabling digital infrastructure, which can nurture the city’s social and economic growth and have a notable impact on the State’s GDP. The Pune Metropolitan Region Development Authority (PMRDA) has invited financial bids from private companies to construct, operate and maintain the third line of Pune metro for 35 years. The Rs 8,000 crore, 23.3-km long corridor will have 23 stations and is anticipated to decongest traffic and propel real estate growth along the stretch. The city will have its first Brownfield electronic cluster common facility centre project at Bhosari for which a Detailed Project Report (DPR) has been submitted. Being developed by Mahratta Chamber of Commerce, Industries and Agriculture (MCCIA), the cluster will span over 27,000 sq ft and would aid in creation of world-class infrastructure in electronic system and design manufacturing in India. With an inventory overhang of 12 months, the lowest among metros, Pune’s price-sensitive market remained stable in Jan-Mar 2018. Affordable and mid-income segments ruled the roost and together accounted for more than three-fourth of the city’s overall demand. Despite the presence of a strong regulatory authority and developers complying with Goods and Services Tax (GST) norms, potential homebuyers were seen opting for ready inventory against under-construction in order to avoid GST. The latter segment, however, witnessed a marginal increment in popularity against the last quarter of 2017. Sales volume did not improve substantially despite the aforementioned positives. The new project market remained modest with a limited number of launches. The developer community was still seen grappling with the policy changes – RERA and GST – introduced last year. Additionally, the lack of investors in the market also kept developers wary of parking their funds in new projects. Even the affordable housing segment, the most popular in the city, did not see fresh supply despite its increasing popularity. Exorbitant land parcels remain a pain point with developers wishing to enter the affordable housing segment. Pune’s realty fortunes rely heavily on the effective implementation of housing, roadways and other connectivity projects under the Smart City ambit. Regular infrastructure overhauls and rapid commercial expansion along the IT corridor are also anticipated to lift residential demand. Developers’ constant focus on improving sales velocity would, however, keep property prices under check in the ensuing quarters. An upswing in enquiries and sales in the affordable and mid-income segments could do little to alter the average property prices in Pune in Jan-Mar 2018. Stringent registration guidelines under MahaRERA restricted new project launches. The city’s rental market, particularly the housing hubs in proximity to the IT corridors, remained buoyant owing to high occupancy rate and regular infrastructure upgrades. Pune’s realty landscape failed to witness any notable price appreciation in Jan-Mar 2018, as majority of the deals materialised in the price-sensitive affordable housing segment. Incentives from the government such as infrastructure status to affordable housing and relaxed GST norms kept the inventory priced within Rs 40 lakh on the radar of potential homebuyers. In line with the previous quarters, ready units and those nearing completion garnered maximum traction due to cautious homebuyer sentiment and confusion prevalent in the market over GST rates applicable on under-construction units. 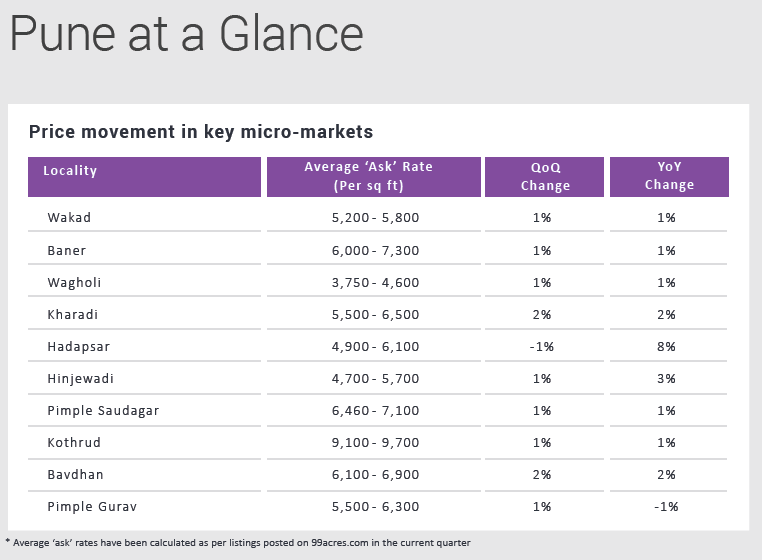 At a micro-level, Alandi in North Pune emerged as the front-runner, recording a four percent increase in capital ‘asks’, QoQ. Affordability, seamless connectivity via roadways and proximity to Chakan, an industrial hub, were some of the growth drivers for the region. The peripheral locales of Katraj and Undri garnered maximum housing demand from end-users due to the presence of IT/ITeS hubs in the precinct and sound road connectivity. These localities observed capital appreciation to the tune of 3-4 percent, each, QoQ. Baner saw a nominal capital appreciation in Jan-Mar 2018, on the back of smooth connectivity via roadways, Mumbai-Pune Expressway, proximity to IT hubs and presence of a self-sufficient infrastructure. The city’s rental market, which is majorly driven by IT professionals, once again outshone the capital landscape in Jan-Mar 2018. Prime localities such as Prabhat Road and Wakad posted an upswing of three to eight percent in rental ‘asks’, YoY. Prabhat Road remains popular amongst the tenant community owing to its strategic location and well-developed infrastructure. Rental values in Hadapsar, a prominent eastern suburb, registered three percent correction in Jan-Mar 2018. High vacancy rate due to ample availability of rental accommodations in nearby Amanora Township acted as a growth deterrent for this locality. Driven by strong demand from the IT community, Kharadi and Pimple Saudagar posted three percent appreciation in rental values, each, YoY. Affordable housing continued to garner maximum buyer interest in Pune. The Jan-Mar 2018 quarter saw residential enquiries gaining momentum, majority of which were noted in the affordable and mid-income segments. The conversion rate, however, remained poor as buyers continued to opt for rental accommodations instead of finalising purchase. New launches remained restricted with developers awaiting absorption of existing inventory. A revival in Pune’s realty market is now dependent on fence sitters taking the plunge in the forthcoming quarters. 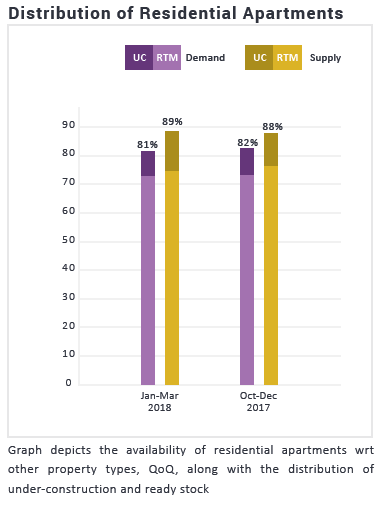 An insignificant dip in the preference for residential apartments was countered by a marginal hike in availability of the units, resulting in the demand-supply gap to widen by two percent in Jan-Mar 2018, vis-a-vis Oct-Dec 2017. Similar to the previous quarter, more than half of the residential demand in Pune remained concentrated towards affordable housing. Extreme shortage of such properties, however, led to a demand-supply mismatch of a whopping 22 percent. Mid-income segment (Rs 40-60 lakh) continued to be the second most preferred budget category with close to 30 percent buyers exhibiting interest in the same. While preference for these homes improved marginally in the last one year, supply remained almost unchanged at 22 percent in Jan-Mar 2018, resulting in a paucity for such homes in the city. Due to lack of investors in the market, high-income segment witnessed maximum inventory overhang of 21 percent in the current quarter. To add to this, demand-supply gap in the ultra-luxury segment (Rs 2 crore and above) widened further, illustrating the weak appetite for this bracket.